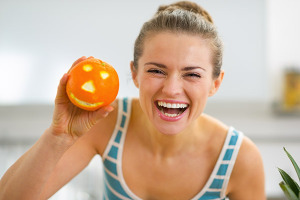 While no sweets are good for your teeth, some Halloween candies are less harmful than others. Try purchasing these types of candies to help protect your braces and prevent tooth decay in yourself and children. Chocolate dissolves quickly in the mouth and can be eaten fast and easy. This decreases the amount of time sugars stay in contact with teeth. However, it is best to avoid chocolates that contain caramel fillings, which tends to stick to your teeth. Try eating soft chocolate with your braces, such as Reese’s Peanut Butter Cups or 3 Musketeers Chocolate. Some sugar-free sweets contain xylitol, which is an active ingredient that protects teeth by reducing the acids produced by bacteria. It also increases saliva to rinse away excess sugars and acids. Although powdery candies contain pure sugar, it dissolves quickly and doesn’t stick to your teeth. To protect your braces this Halloween, avoid candies such as popcorn, nuts, gum, hard chocolate, caramel and chewy candy. We are devoted to helping you achieve and maintain a healthy and beautiful smile that will last a lifetime. Our experienced team will provide you with high quality dental care. We encourage you to share your experiences at our office on Google. For more Halloween tips, contact us today.